And welcome to my newsletter for February, 2012! Please feel free to forward this to anyone you think would be interested in keeping up with me! To receive these newsletters regularly, please drop me an email or subscribe online from my website (http://www.JefMurray.com ) or at: http://groups.google.com/group/Mystical_Realms . Notices of events and items of interest are at the bottom of this email. IMPORTANT! I will soon be repatriating my Middle-earth themed paintings and sketches currently held in the UK. As a result, I would like to offer my UK and European friends a unique opportunity to purchase some of these items before they leave the continent. Effective immediately, and continuing until midnight on Mardi Gras (February 21), we are holding a one-time-only half-price sale of all framed and unframed paintings and sketches currently held by ADC Books (see www.adcbooks.co.uk). Please note that the sale includes all 10”x16” and smaller canvasses in the ADC Books catalog as well as all unsold framed and unframed sketches, including original sketches for Black & White Ogre Country: The Lost Tales of Hilary Tolkien. The sale also includes a few wooden “cutout” dragons! Please take a look at the ADC Books catalog. If you have a question about a work, please don’t hesitate to contact Andy Compton directly at andy@adcbooks.co.uk or phone 07785-110512. If you are unable to reach Andy, feel free to contact me and I should be able to help. The bell on the front door of the shop rang. The Dwarf peered through the curtain separating the storefront from his workspace. “Ah, it’s only you,” he said. Eyebrows bristled over a broad nose and his beard was shot through with strands of silver. He pushed aside the drapes and emerged from behind the jewelry counter. Gabriel wore an oilskin riding coat that was spotted with melting snowflakes. Outside the jeweler’s window, flocks of white flakes surged through the streets, softening the hard edges of the dingy downtown door stoops. Two sparrows huddled on the lamppost just outside the shop door. Gabriel smiled, but the jeweler showed no indication that he had attempted a joke. The Dwarf looked past Gabriel and scowled. The tall man turned and saw a young woman approach the doorway. She hesitated as she glanced inside, and then turned away. “Were you expecting someone?” asked Gabriel. The jeweler scowled once more, but turned around and motioned for Gabriel to follow him back behind the curtain. Gabriel recognized the oilcloth-covered table and the cabinets in the darkened workshop. As usual, tiny pairs of pliers, hammers, and rolls of silver and gold solder lay haphazardly on the table surface; the only light came from an ancient oil lamp that swung from the low-beamed ceiling. The Dwarf perched upon a high stool and motioned for Gabriel to take a seat. He did so, and then surveyed the jeweler’s face closely. The Dwarf avoided his gaze, and looked down at the tabletop, pushing a golden chain he had been working on out of the light. “Mistrustful still, I see,” said Gabriel. “I don’t need your help, and I don’t need your pity!” growled the Dwarf, “and if that is the ‘service’ you wanted from me – to become a soft-hearted fool like yourself – than save your pennies, your piety and your platitudes. I’ve no use for any of them!” Dvalin glared at Gabriel and made as if to rise from the table. “I have a different request to make, one I think you alone are trustworthy enough to fulfill.” Gabriel reached into the pocket of his coat. He withdrew his hand and stretched it out, into the light. “Not Mithril,” said Dvalin, eyeing the ring closely. Dvalin gingerly plucked the ring from Gabriel’s palm and screwed a jeweler’s loupe into his eye. He studied the surface of the ring closely, and then gasped when he glimpsed the stone. “Then they were killed by the ring? !” The Dwarf put Linya back on the table and shrank away. Dvalin looked at the ring, then slyly back up at Gabriel, then again at the ring. The oil lamp sputtered above them and in its flickering flame, shards of ultramarine and cobalt light flashed from deep within the ring’s sapphire. The two rose and returned to the storefront. Gabriel bowed to Dvalin, bid him good evening, and then left the shop, disappearing into the thickening snow. Dvalin stood behind the counter with the ring clenched in his fist, frowning as pedestrians hurried by. He recognized most of those who passed his shop window: many owed him money for jewelry or repair services; others he considered cheats, only interested in gouging him for the tools and materials he needed for his work; still more were competitors whom he considered grasping and unscrupulous. His secretary, too, he mistrusted, even though she had been with him for several years and had always done her best to please him. He looked at Linya. “Might as well get this over with,” he said, slipping the ring onto his finger. He felt nothing but a slight tingling sensation. He looked around him. The storefront had not changed, nor had his reflection altered in the mirror behind the counter. The hands on the store clock still read 5:30. Outside, the snow thickened further, but now dusk was falling. He was about to take the ring off again when he saw a figure approach the shop door. It was his secretary. She peered inside, and seeing him alone, she gently opened the door and stepped out of the storm. She looked at him, shivering. “For heaven’s sake, Cailie, get over to the stove before you catch cold!” Dvalin’s voice startled both of them. Cailie’s eyes grew wide, but she quickly stepped toward the wood stove that heated the room. “Give me that coat,” Dvalin said, stepping toward her. She looked alarmed, but slid out of her coat and handed it to him. He hung it on a peg near the stove so that it could dry. Dvalin turned back toward his secretary. She seemed suddenly small to him, and vulnerable. She was still shivering. He had never paid her much attention, but now he noticed how the cold had colored her cheeks, and how thin she appeared. “Have you had anything to eat today? While you were out?” he asked. He rummaged in the back room and returned with a loaf of bread, some cheese, and a bottle of red wine. He placed them on the counter near her. Looking astonished, Cailie slowly sat down behind the counter and began eating. Dvalin watched her for a moment. What was it she reminded him of? He recalled a featherless sparrow he had once found lying helpless on the ground, so many, many decades past, when he was a boy. He had fed it bits of bread and milk until it had fledged and flown away. “Why are you being so nice to me?” she asked, looking up fearfully. The question startled Dvalin. A scarcely-recognized emotion swelled within his breast, and as his eyes filled with tears, it occurred to him that he had never said so much as a kind word to Cailie before; he had always been too busy, too mistrustful, or too angry about some perceived grudge that he was nursing. “I…I just want to make sure you’re alright. What with the snow and all…” he stammered. He felt ashamed and looked down at his hands on the counter. Then he saw the ring, still on his finger. And he remembered Gabriel’s words: “She is incapable of causing harm; indeed, Linya can bring only good to her bearer.” He wondered…. “Are you warmer now, my dear?” he asked her, hesitantly. “Yes. Thank you. I’m much better now.” And Dvalin continued to watch her as she ate, her pale fingers like the beak of some tiny hatchling, pecking at the morsels of bread and wine. • The Middle-earth Network ( http://middleearthnetwork.com ) continues to be the “Go To” place for news about Middle-earth-related and Narnia-related events and for discussions on its social network, http://mymiddle-earth.com/ . Plus, the site has just been revamped with improved functionality and the opportunity to create your own Blog webpage, absolutely free! Along with podcasts with folks of interest to Middle-earth and Narnia fans, there are contests, articles of interest, pointers to intriguing websites, etc. If you’re not a member yet, you’re missing out on a great community of artists, musicians, and general lovers of Tolkien and Lewis! • The Return of the Ring 2012 (see http://www.returnofthering.org/) will be a huge Tolkien-themed conference and gathering at Loughborough University on 16-20th August, 2012. I am an invited guest at the event and am looking forward not only to sharing my paintings and sketches, but also to participating in panels and presentations. You can book reservations now online. You already know how I feel about your storytelling, but I have to say again there is something so profound for me in regards to your sketches. 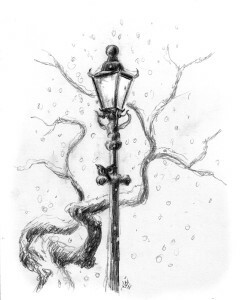 I don’t know how to articulate it well, but looking at the image of the lamppost makes me feel something otherworldly yet at the same time, I don’t know,……cozy, familiar, it’s the same feeling I get when I walk into that old bookstore that beckons with the feeling of welcome home and adventure can be found here. Your color work is brilliant and gives that more mystical feeling, and majestic sense….but something on the tip of my tongue…some old friend beckoning that I feel when looking at your sketches. Thank you Jef. Love the story Jef. More like that please! Bless you for the tips, and your blog really looks tremendous. Exactly what wp theme are you employing?